The Pirelli P6 is a great tyre for family cars and users who are looking for a high level of comfort, with less of a focus on the sporty feel delivered by many of the P cinturato range. 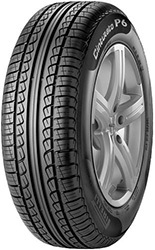 With a stylish tread compound, and great perfomance in all conditions the Pirelli P6 cinturato is great all round tyre. For those that cannot find it in their size the Pirelli P7 is also great option and has a slightly wider size range with a lot of the same benefits and features as the Cinturato P6. Pirelli has deisgned the P6 Cinturato to be as eco friendly as possibly and has three key markings on the side of the tyre to highlight how this tyre helps the environment.